Don't get too concerned with Skaggs' line on Friday (4 IP, 4 ER, 7 K). The three home runs he allowed were aided by a very hitter-friendly wind at Wrigley Field. The good news is he didn't walk anyone. In fact, Skaggs' walk rate continues to go down, under 5% this year. 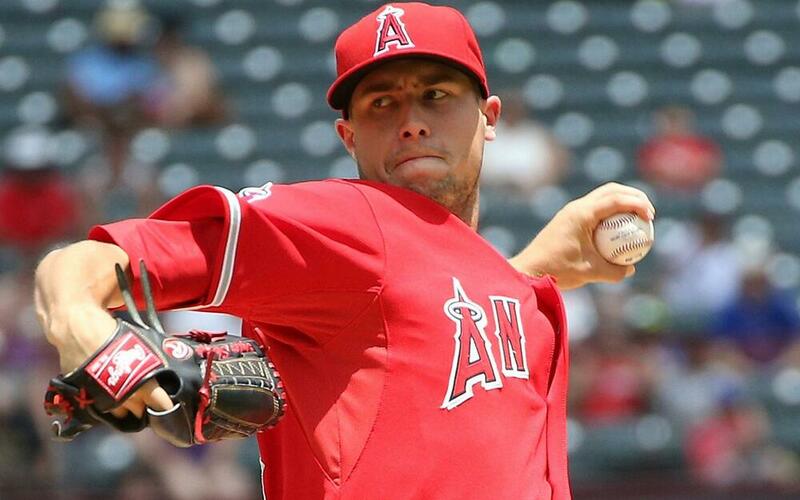 Skaggs is following the trend around baseball to reduce the use of his fastball. On Friday, he threw his heater 39% of the time. That coincides with a decreased velocity, although that can be common early in the season. Through three starts in 2019, Skaggs has 14 strikeouts in 15 innings. That follows the uptick he saw in K's in 2018, but with the increased swing-and-miss potential, he's also seeing opposing batters hit the ball harder. In fact, his hard hit percentage this season is nearly 50 percent. That could cause problems, although last year Skaggs' HR/FB rate was only 11.5% despite a 40% hard hit rate allowed. That velocity drop would be the thing to watch with Skaggs. If he continues to lose a mile per hour off his fastball, expect some regressive changes to his strikeout rate and even hard hit rate. When is it time to get on board with a guy whose Triple-A ERA is over 4.50? When is it time to buy into a guy whose strand rate is nearly 90%? Prior to Friday's blowup versus Tampa Bay, it was tempting. Thornton was stellar in his first two starts, but the Rays exposed some vulnerabilities in his 3+ innings of work. They tagged him for eight hits, including three home runs and two walks, en route to five earned runs allowed and his first loss of the season. His pitch selection jumps off the page on this performance though. Coming into the game, he had used his fastball more the 50% of the time, but on Friday he did not have a good feel for that pitch, throwing it less than 40% of the time. He turned to the curveball, which is really good and was relatively effective on Friday, but this shows what happens when the youngster doesn't feel confident in his heater. And by extension, when his fastball is off, the changeup is unusable (he only threw it four times on Friday, to no avail). Through his first two starts, it was his changeup that allowed him to be especially productive. He's good enough, especially as a reliever, with the fastball/curveball mix, but he can become a reliable starter with a changeup that he was using more than 10% of the time. For now, a poor start like Friday should not be enough to cost him a spot in the Blue Jays' rotation. Galvis cooled off from his recent hot streak in a brutal way, wearing the hat trick, striking out three times before an 8th inning double extended his hitting streak to seven games. Galvis has proven he is capable of double digit home runs and stolen bases, but he is a liability in batting average. Last year he sold out a little more for power, increasing his hard hit rate by 15 percent but also seeing his swinging strike rate rise 4.5 percent. Unfortunately, while his hard hit rate is down slightly in the early going of 2019, his swinging strike rate continues to increase. In correlation, his contact rate is down. That means we could see an even further dip in his batting average. Pay no mind to the .378/.417/.711 line he's slashing right now. He is boosted by a .419 BABIP and a 22.2% HR/FB rate. Galvis' career high in home runs was 20 in 2016. With his obvious power-focused approach, it's conceivable he can reach that number again, but that will probably coincide with a batting average closer to what he hit in that 20-homer campaign. It was .241. Believe it or not, Correa has the highest wOBA on the Astros. Well, let me take that back. Jake Marisnick has the highest wOBA for the Astros and Carlos Correa is 2nd. Correa finally appears healthy after a couple injury-riddled campaigns. On Friday he was 2-3 with two walks, lifting his slash line to .341/.426/.585. He's another player boosted by early-season BABIP. Correa is riding a .444 mark, but he is also hitting the ball with more authority than last year. An area of concern is a swinging strike rate in double digits for the first time in his career, combined with a career-low swinging strike rate of 74 percent. The thing with Correa is he's still only 24 years old. STILL! So as much as it seems like he's been around for awhile, the former top overall pick is continuing to learn and likely continuing to improve. Sitting at the top of the White Sox lineup, Garcia is making the most of his opportunities, especially against left-handed pitching. He had two doubles off southpaws on Friday and faces CC Sabathia coming off the injured list on Saturday. Sabathia isn't likely to last long in the game, which gives Garcia the opportunity to mix it up with some middle relievers. He's not going to provide you with the "double-dong" potential you desire in tournaments, but Garcia makes good contact and provides speed and on-base ability in a lineup that should score some runs.